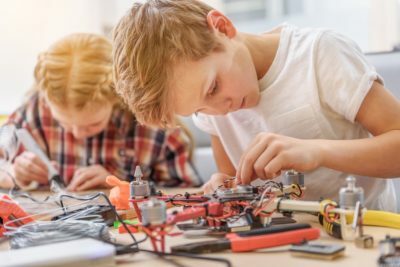 Some parents believe they shouldn’t let their kids use electronic devices; other parents are excited to introduce their children to the future of technology—this post is for those folks in the latter camp. We agree! The world is changing, and our kids need to be at the forefront of innovation. 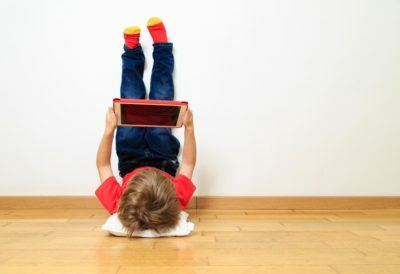 Restricting their time with their devices, or which devices they can use, might have noble intentions but ultimately, it leaves kids at a disadvantage when it comes to living in immersed with tech. Technology doesn’t have to be scary or all bad! These fun tech tools show the potential that nifty gadgets have for improving children’s cognition while also keeping them entertained. What we love best about the Amazon Fire Tablet Kids Edition—other than the awesome warranty and shock-proof bumper—is the parent control features that allow you to set goals and rewards, along with blocking your content of choice. For example, they can play a game for 15 minutes if they read three chapters, or screen time can automatically turns off at whatever time you decide. Good news, parents! With the development of technology, you can now find a kid’s laptop that’s affordable in price and durable in construction! Your tot is already comfortable with smartphones and tablets; take it up a notch by showing them how to interact with a Chromebook. display. It operates on the Google operating system, so your little ones will be able to interact with all the same apps their parents and teachers use at school. Training them how to use a computer early on is the best way to develop healthy habits, proper posture, and prevent tech from being dropped and broken. Artificial intelligence is the way of the future; introduce your kid to the world that’s coming with his or her build-your-own robot kit. These make for the perfect gift for a 12 year old boy who loves technology and robots, plus it’s an awesome STEM educational tool. They can stretch their imagination and build all sorts of things including a robot tank, car, and dozer. Most programming is based on the 3.0 programming system, so every time they play with their robot kit, they’ll gain exposure to the basics of coding. Drone kits for kids are both entertaining and educational, and this model in particular is designed for young beginners. The DIY kit helps encourage kids to develop skills in the core science, technology, engineering, and math disciplines. The instructions encourage children to work as a together as a team, and when they work on their hand-on project with friends, they improve their social skills! You can watch as they build, use tools, and create stories using this educational toy. Playtime just got more meaningful! A kid’s smartwatch is a great solution for kids too young for a smartphone. Parents can have better peace of mind when giving their children the space they need to grow, explore, and have fun. With a device like the dokiWatch S, kids can contact family members with ease using the text or call features, and parents can monitor their kid’s location at a glance thanks to the GPS tracker. The smartwatch also tracks fitness, encourages children to tell time, sends friendly reminders to complete tasks, and delivers geo-fence alerts to parents. This is one kid’s tech tool that’s designed with Mom and Dad in mind. Let your kid make up his or her own fun with a spy kids set complete with everything they need to solve their next big mystery. Whether it’s the Case of My Missing Homework or the Day Dad Did Laundry, the binoculars, flashlight, magnifying glass, marker pen set, and fingerprint powder and brush will surely help your little detective get to the bottom of any funny business. From nine year old birthday ideas to the hottest kids’ tech, we have you covered with all the best toys and games!